Gua sha (Chinese: 刮痧) is a traditional Chinese medical treatment in which the skin is scraped to produce light petechiae. Practitioners believe that gua sha releases unhealthy bodily matter from blood stasis within sore, tired, stiff or injured muscle areas. Gua sha helps to stimulate new oxygenated blood flow to the areas and therefore promotes metabolic cell repair, regeneration, healing and recovery. Gua sha is sometimes referred to as “scraping”, “spooning” or “coining”. Researchers have shown that gua sha causes a dramatic increase in circulation in the soft tissues under the skin. Additionally, a Harvard study (conducted on mice) found that gua sha encourages cells to create heme oxygenase-1 (HO-1). A potent cytoprotectant and antioxidant, HO-1 also fights inflammation. In 2011, researchers from Harvard and Massachusetts General Hospital found even a single gua sha treatment had a positive effect on people who suffered from hepatitis B (which causes liver inflammation and degradation). Red marks will appear on your skin after a session, but should completely go away within a few days. The benefits of gua sha seem to occur after blood is brought to the surface of the body during treatment. As the body reabsorbs this blood, it breaks down hemoglobin triggering the production and release of HO-1, bilirubin, biliverdin, and carbon monoxide. These potent chemicals fight infection, inflammation, and a number of other diseases. If you would like to see how Gua sha can help you relieve pain or stress please contact us below or call us +971 4 886 2862 and make an appointment. 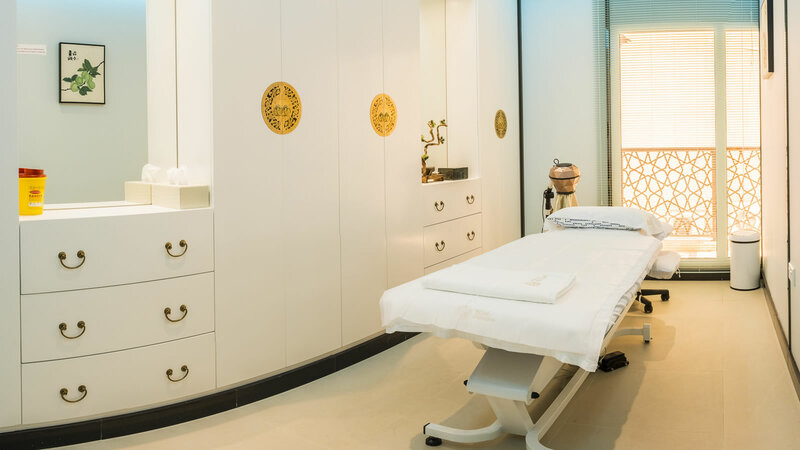 How is Gua sha used in Chinese Medicine at TCM Shanghai? At TCM Shanghai, the patient goes through a TCM Health Screening and a doctor’s consultation prior to the treatment. Based on the findings, the practitioner determines how to proceed the treatment. By palpating (touching) your skin, practitioner will see if there’s any “sha” (blood stagnation) present. Then, will lubricate your skin with an oil to minimize abrasion. The smooth edge is pressed down firmly, and then moved down the muscles, along the pathway of the acupuncture meridians, along the surface of the skin.